I spent yesterday at beautiful Holy Hill, the Basilica of the National Shrine of Mary Help of Christians, for a Mass of Thanksgiving with Cardinal Dolan. Oh my goodness what a wonderful day. I don’t drive, but when I mentioned it to my friend Jeanne (whom I have discovered is the aunt of Matt of the popular blog The Badger Catholic) she was eager to go–even though she spent Friday on a long road trip with her husband to the Shrine of Our Lady of Good Help; she joked that she’ll have to go to the Shrine of Our Lady of Guadalupe in La Crosse tomorrow, for the trifecta. But it would be hard to top this day, which she called indescribable. It was a gray and wet day! 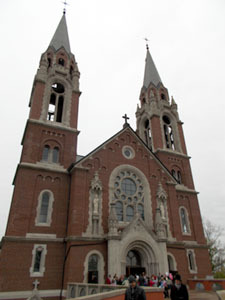 The spectacular brick church in the countryside of woods and farms west of Milwaukee, stands atop the tallest hill in that part of the state, and has been a place of pilgrimage since the mid-19th century. The current church was built by the Discalced Carmelite Friars, the religious order which continues to administer the place and serve pilgrims. 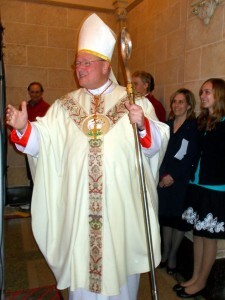 During his time as Archbishop of Milwaukee, it was Dolan himself who had Holy Hill named a minor basilica. Fr Don Brick did a great job with preparations. 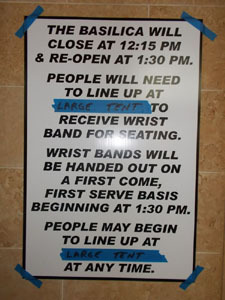 Inside the tent, we waited to get wrist bands. The Cafe folks had a sandwich and drinks tent outside. A digital projector displayed a live image of the inside of the Basilica church on the screen. We attended Holy Hill’s regular 11am Saturday Mass, before going back down to the upper parking lot where a large tent had been erected in which there were already a large number of people waiting in a “sitting queue”. 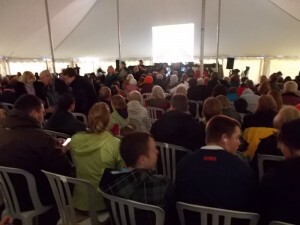 It was not long after 1pm that the tent was nearly full, and they began giving cardinal-red wrist bands row by row, and we walked up to the Basilica (by the stairs, the “Saint John of the Cross way” as opposed to the elevator, the “Saint Therese way“). We and another nice lady we had met took seats at the very back. I was delighted to catch up with some Secular Carmelites I know who were ushers. Jeanne went back down to the bookstore where the Cardinal’s brother Bob Dolan was signing copies of his book, Life Lessons, From My Life With My Brother Timothy Cardinal Dolan, and got me one too, thank you Jeanne! At 3, Jeanne urged we should pray the Chaplet of Divine Mercy and we did. 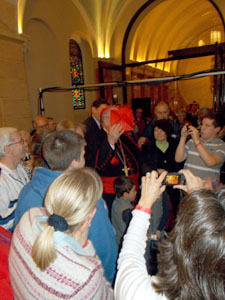 Some time thereafter, Cardinal Dolan emerged from the oratory off the left side of the sanctuary and began making his way across the front of the church, greeting everyone, showing his red biretta, wanting to share it with everyone, who indeed enjoyed it. People mobbed him like a rock star. But not entirely like that; this was the enthusiasm of people who love being Catholic: a lady of about 28 crowded next to me said, as the crowd jostled, “we should remember we are in church.” Cardinal Dolan joked, kissed babies, put the hat on a little boy for a photograph, gave hugs, listened sincerely, and eventually made it over to the Shrine Chapel of Our Lady Help of Christians, where he prayed, before heading into the sacristy. This side chapel was also filled with people, who had a screen in there to view the Mass. At 4 everyone prayed a Rosary, the Joyful Mysteries with the meditations written specially for the day by Carmelite nuns of 5 different provinces. Fr Michael sees me! 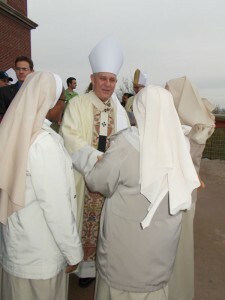 He is one of Holy Hill's Discalced Carmelites. He is wonderful! Behind him is Fr Jude, the prior. The thurifer (holding the chain) recognized me also from Madison and came over to me. 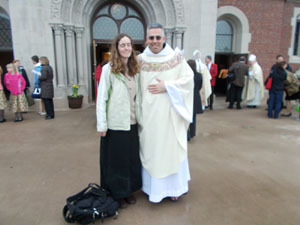 I was embarrassed I cannot remember who he is except he is a seminarian! And very nice. Madison's Bishop Morlino was celebrating Mass for a Knights of Columbus State Convention in Middleton yesterday, but most of his brother Wisconsin bishops were present. He is obviously not the type who likes having his ring venerated (kissed)... but I was not the only one who did so, in fact another friend from Madison told me she did too! In this image, someone had told him about so-and-so whom he might remember and he said something hilarious like "oh yeah, how is that cow of his! That cow, was her name Bessie, with the spots?" 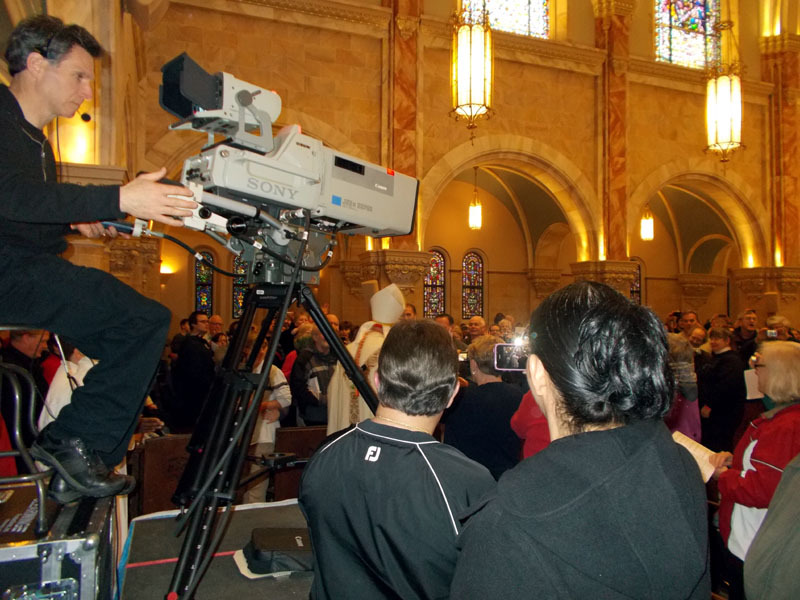 Mass was being broadcast live, not only to the people in the Shrine Chapel, and downstairs in the Saint Therese Chapel, and outside in the tent, but also online and on TV. Cardinal Dolan incensing the altar at the beginning of Mass. He is there. There is an honor guard of Knights of Columbus. Holy Hill is not really yellow. I apologize, I just got this camera and I should have read the instructions. This was not a completely normal Mass, partly because it was broadcast. It involved a lot of laughter and a lot of applause and cheering for one thing, not something one is not supposed to do at Mass. It is just a bad idea. Yes I clapped and cheered too! Maybe I shouldn’t have even though everyone else was. Cardinal Dolan’s homily kind of invited it though! To hear directly what Dolan said, visit Milwaukee’s Fox6No which w has several videos from his Mass. The Milwaukee Journal Sentinel wrote a pretty decent article. The first 3/4 of the homily involved joking, thanks, a display of the red hat and assurance that as he told New York he wants to put it on top of the Empire State Building or the Statue of Liberty, he wants also to put it on some appropriate feature of Milwaukee. 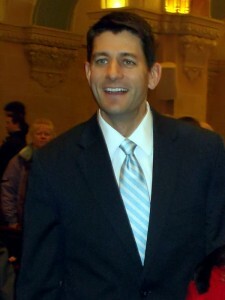 He was grateful for the presence of the Wisconsin bishops who were there, Listecki, his auxiliary Bp Hying, Bp Callahan of La Crosse, and Bp Ricken of Green Bay (there was also an Eastern rite Catholic prelate), and also for the presence of some civic leaders: Governor Scott Walker and his wife, Representative Paul Ryan with his young daughter, Representative Sensenbrenner, Former Gov Tommy Thompson, and others. 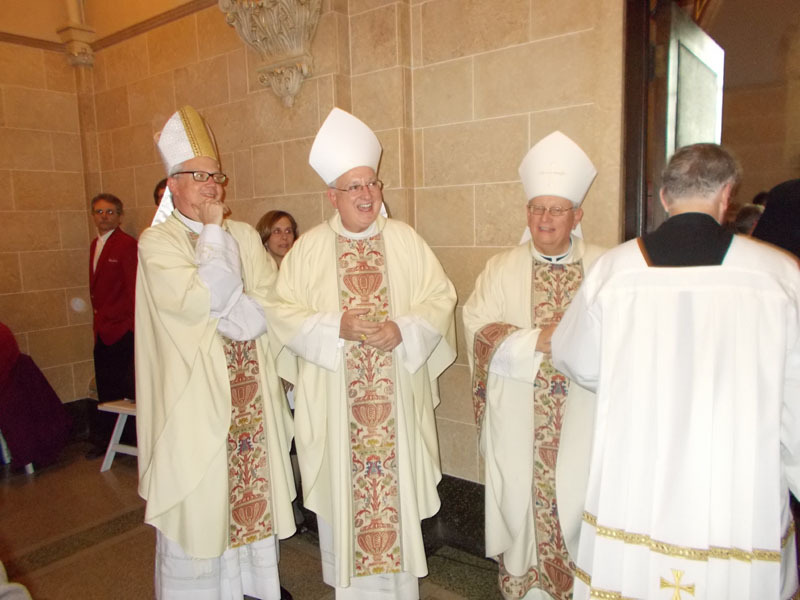 I had no idea they were present, and likely neither did most, Walker received explosive and sustained applause, Ryan received similarly great applause, stronger than the applause with which Cardinal Dolan received during Abp Listecki’s welcome to him. The videos available online cut to the politicians’ faces; their reactions are reserved, they are just listening to Dolan. 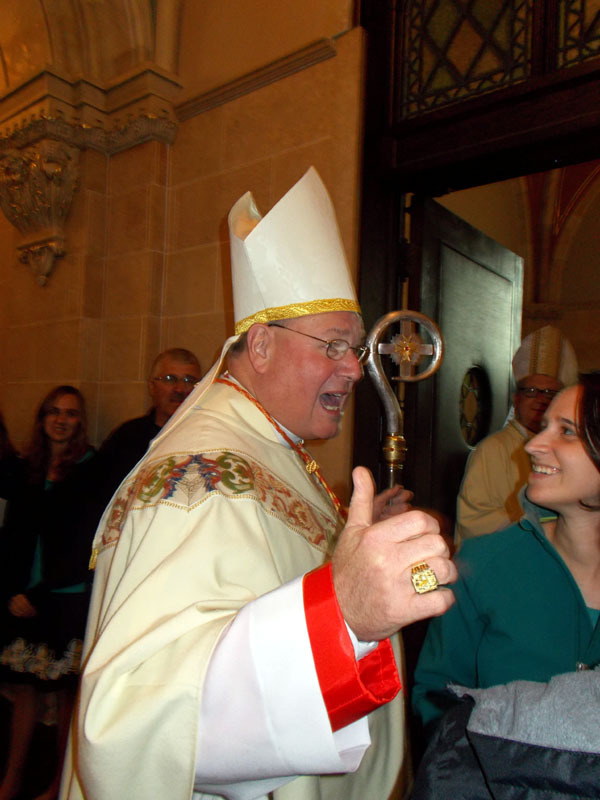 When Cardinal Dolan kids Walker “Governor, take heart. I got recalled back here from Archbishop Listecki,” Walker laughs of course! Someone got upset on facebook when I mentioned that people applauded Walker and Ryan, and that it appeared there is strong support for these men from practicing Catholics, and Cardinal Dolan didn’t seem dismayed by the applause. Well that is just the fact of the matter. I already pointed out applause doesn’t actually belong at Mass; God is good and perfect so let us adore Him; politicians are what they are. It was anyway an interesting moment of contact of Church and state. We are not separate and opposed to one another, as if the sheep of the flock were the “Occupy movement”‘s 99% and the shepherds the resented super-rich. He describes visiting Ireland where a literal shepherd told him frankly the worldly reality of shepherding: when you look at sheep you see cuddly lambs to hug, but when the Irish look at sheep they see sweaters, lamb chops and mint jelly! No no no, the Cardinal’s red vesture signifies he must be a good shepherd ready to lay down his life for his sheep as in the Gospel. 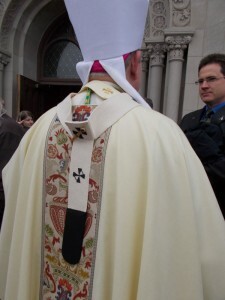 What Dolan had to say was in effect (my interpretation): I want to put this red hat on you, and, you who were my flock have been shepherds to me, have formed me as the man who is now Cardinal Archbishop of New York and President of the US Bishops’ Conference, and I love you and I thank you because you have showed me Jesus the Good Shepherd. 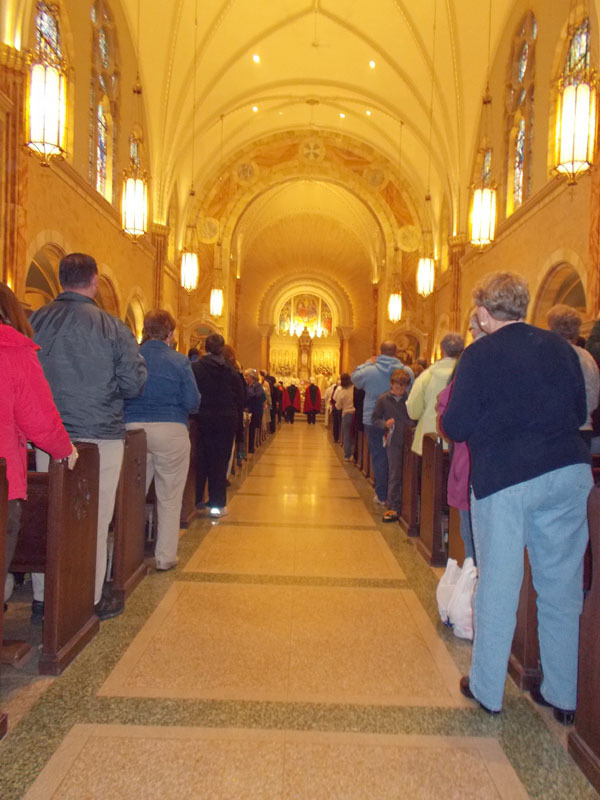 One excellent thing about committed Catholics is they are serious about the Mass, and so everyone participated fully and actively, moreso than you would see on the typical Sunday. The music was mostly familiar things, it would be wonderful if a sacred music program with Gregorian chant and sacred polyphony could be developed at Holy Hill! The usual lady cantor sang “Panis Angelicus” after Communion and I am just happy for something in Latin. The recessional hymn was “God we praise you” which is both a good hymn and entirely suitable to the occasion. As they processed out, Dolan again was a laggard, as he would not process properly but simply had to greet everyone, especially the Knights of Columbus honor guard members lining the aisle with swords drawn. Afterward, Jeanne noticed that Gov Walker was still at his pew and speaking with people. I live right in the middle of downtown Madison and have seen nonstop (truly nonstop) ugly “recall Walker” protests. I actually pay rather little attention to politics but the sheer nastiness of the protests, has taught me a deep sympathy for the governor, whom I would always pray for when I saw that. One recent day when I was walking home from 12:10 Mass at St Patrick’s, past Capitol Square, there was a huge amount of obnoxious noise of stadium horns and bellowing and shouting from several perpetually present protesters, as I got closer I heard cries and cackles, “Walker! He was right there just 30 seconds ago, standing outside a car talking!!! I saw that #%&@ Walker!” I don’t have a TV and believe it or not only dimly knew what Scott Walker looked like. But now face to face, I shook his hand and just said I was pleased to meet him, and my friend would really love a picture with him. This was an even lovelier picture of Congressman Paul Ryan with his adorable little girl in a red coat, but I painfuly edited her out because I did not find other pictures of her online and I think some public figures prefer the privacy of their children. 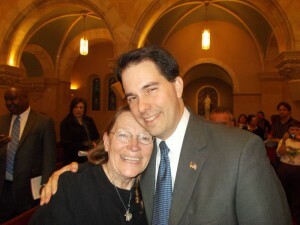 She had Gov Walker sign an autograph for her! Ryan is Catholic and says that the Catholic social teaching on subsidiarity influenced him in crafting a Federal budget proposal. At a press conference at Holy Hill, Dolan called Ryan a friend and explained that subsidiarity and solidarity with the poor are both important, and the virtue lies somewhere in the middle. The Pope specially blesses lambs who go on to produce the wool for the palliums given to metropolitan Archbishops, I think if you click the image you will be able to see it bigger. You can see my camera's default setting works much better in sunlight. Unfortunately you cannot see either of our eyes. 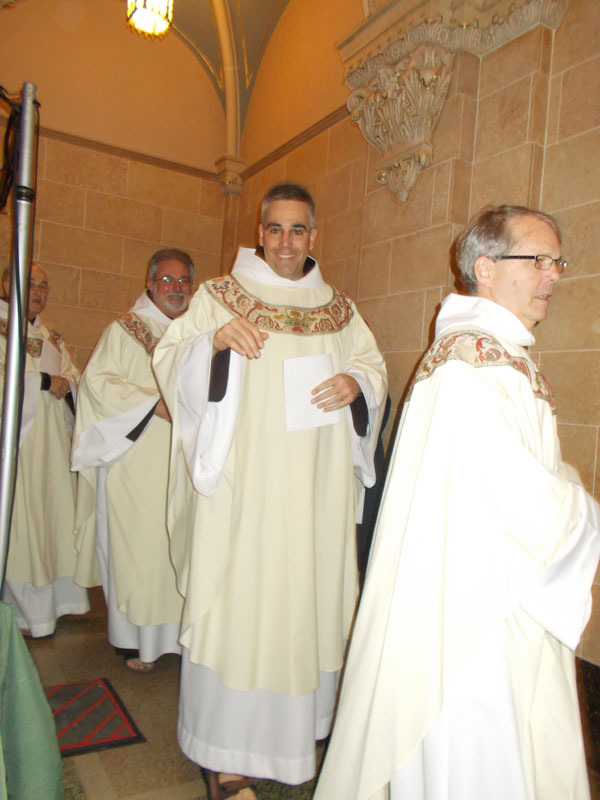 The good and kind Fr Michael Berry, OCD is the vocations director for the Washington Province of Discalced Carmelites, a Provincial Councilor, and best hope for their future. So, an extraordinary day. Catholics, love your shepherds, they love you, we are one in Christ’s body the Church, wherein the little ones share the honor of the princes of the Church. I wish I had been able to get a picture of Cardinal Dolan with that little boy with the cardinal hat on, but please close your eyes and picture that for yourself here! 4 Responses to Cardinal Dolan at Holy Hill! Holy cow, Elizabeth, you did an excellent job here!!!!!!!!!!! Wonderful experience. I was completely on the wrong side of the boy wearing the biretta, but I did get a picture of the back of him. Fantastic photo, Allie, thank you so much!! People ought to visit your flickr account to see lots of really nice pictures of this event! This is a wonderful and thorough post! I think that my family and I must have been sitting on the opposite side of church from you, also in the back. 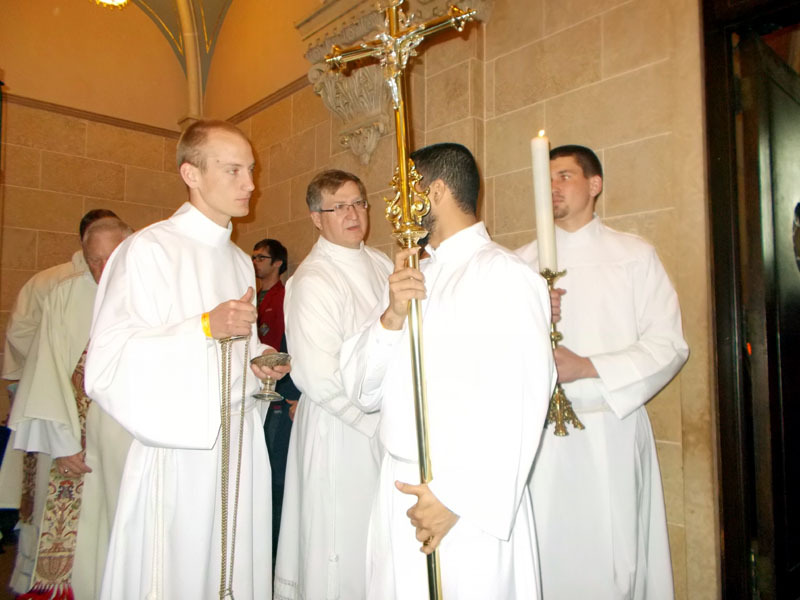 The seminarian with the thurifer is Mark Petrie, a wonderful and holy man!